I am in total love with Stampin’ Up’s new Mini Treat Bag Thinlits Dies from the current Occasions Catalog. At first, I didn’t think I really needed it. 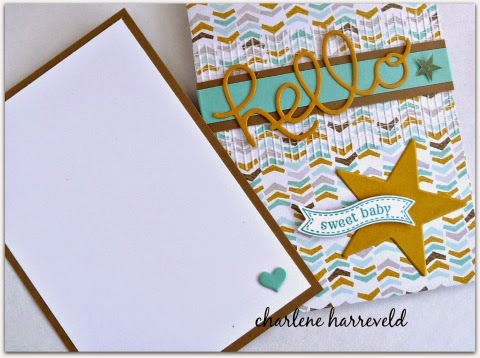 However, I realized that I could use it to make a cute pocket card and now I am addicted to it! In addition to the dies to make the treat bag, you also get a heart and star dies, a banner and a bow die, a word window die, “enjoy” and “for you” word dies, and three different border dies. This card make me so happy to look at. To me, it is more than just a card. It is a symbol to me of my return to being a Stampin’ Up! demonstrator full-time. I took time off to get my business off the ground and to take care of my husband during his battle with colon cancer. I don’t know what it is about this card, but it just makes me smile! Time is running out to take advantage of Sale-a-Bration!! Place an order of $50 before s/h and tax and receive free product!!! Read more HERE. ← Help! I Ran Out of Sequins!